This beautiful African doll is wearing a gorgeous pink gingham dress and pale pink shoes and white socks. The Soy Tu dolls are charming with their closing eyes made from safe transparent plastic that have a wonderful pigment and pattern. Their hair is shiny, straight and easy to comb with the My Doll Best Friend Essential Doll Hairbrush. The dolls are completely handmade. The detail of their faces (freckles, cheek colour, lips etc), their hairstyles and the assembling of the clothes and accessories is done manually in the factory in Spain. They have thick eyelashes on their upper eyelids which enhance their eyes. 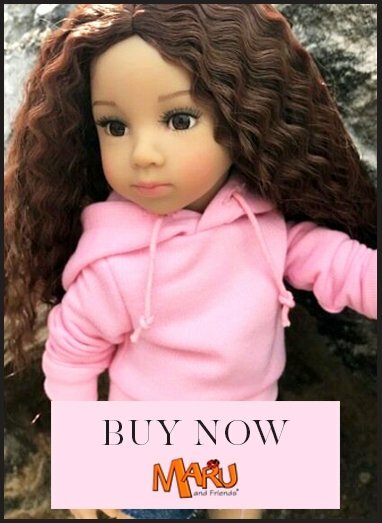 The facepaint is very natural making the dolls look particularly alive and the subtle scent of vanilla is very appealing, particularly to young children. The doll's arms and legs are articulated and the head turns from side to side and they can easily be put into a standing or sitting position. The Soy Tu dolls have full vinyl bodies and can stand unassisted. They are 42cm or 16.5" tall and can share some clothes and shoes with other dolls in the My Doll Best Friend shop. Paola Reina was established in Spain in 1994 and has achieved worldwide success with its beautiful dolls. Soy Tu translates to "I Am You". Each doll is unique and special in its own way. Paola Reina dolls are thoroughly European as not only are they made in Alicante in coastal eastern Spain, all their component parts are sourced from Europe.